The sword (jian) is mainly used for defense. It requires a strategy of calmness in action. Sword training helps practitioners develop patience, calmness, and bravery. The double edged sword in considered the king of short armaments. We have carefully selected this jian because it is well built, has good balance, and is affordably priced. 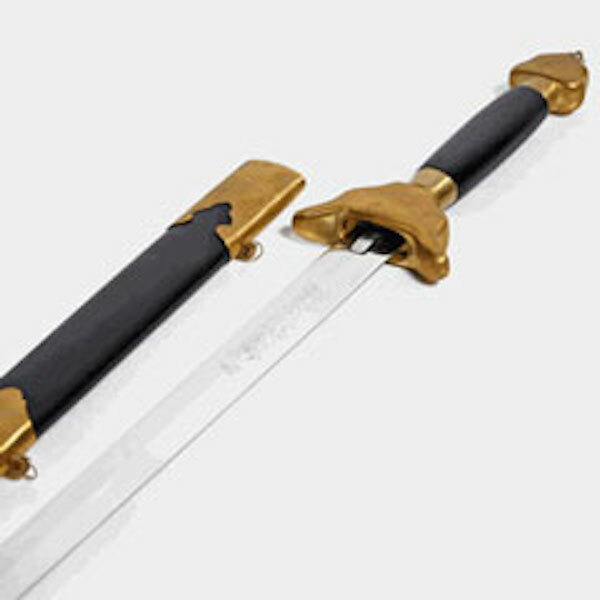 This sword is ideal for either tai chi or kung fu training. This sword comes complete with scabbard and carrying case. We rate this sword as a good choice for every day training. Get one today and enjoy years of use. Never lay your sword on the ground. It will absorb moisture (bad), and somebody may step on it (really bad). Never touch the blade with your bare hand. The sweat can accelerate corrosion. Avoid unnecessary cutting with your blade. Too much cutting will shorten the sword's life. Always keep the sword sheathed when not in use. After use, apply a light cot of metal grease or oil to the blade. The wood handle and scabbard should be treated with a wood polish. Our Tai Chi Ball Polish will work well for your swords wood components. Stick with practice swords until you are ready for a real sword. Real swords are really sharp. Be smart.